Arrhythmogenic Right Ventricular Dysplasia (ARVD) is a challenging clinical entity, due to its infrequent presentation, difficulty in diagnosis and the outcome of missing it could be lethal. First described in 1977 by Fontaine et al. And in 1982, with Marcus et al the clinical features of 24 French patients were first reported. Inherited by autosomal dominant transmission of affected desmosomes. Characterized by pathological presence of exceedingly large amount of fatty tissue and strands of cardiomyocytes bordered or embedded in interstitial fibrosis, constitutes the arrhythmogenic substrate, leading to life-threatening ventricular arrhythmias. Regional wall motion abnormalities are the earliest signs of Right Ventricle (RV) myocardial damage that will progress later to global injury leading to RV dilation and failure, with Sudden Cardiac Death (SCD) in young adults as the major concern in the early stage of the disease. Although it mainly affects the RV, some variants of ARVD can also affect the left ventricle with or without involvement of the septum. The recessive form is extremely rare. The aim of this article is a quick review on ARVD, how to recognize the clinical manifestation, how to diagnose it and how to approach relatives to SCD victims. Under-recognition makes the prevalence of ARVD indefinite, roughly estimated to be around 1 in 2000 to 1 in 5000 in the general adults population. Sudden Cardiac Death (SCD) is the major concern in ARVD, which accounts for approximately 3% to 5% of all cases of SCD in adults under the age of 65 years and even up to 20% in younger ages and among athletes who die suddenly[5,6]. In fact, competitive sport doubled the risk of having ventricular tachycardia and death in comparison to recreational sport and inactive patients. 30% to 50% of family members who were studied by non-invasive tests were found to have evidence of the disease. The clinical profile of a patient with ARVD is very ambiguous, usually shows up between the 2nd and 5th decade, with a variety of presentation that mimic other diseases, including dyspnea, dizziness, palpitation, chest pain, but often heralded by syncope and SCD. On the other hand, patients may remain clinically asymptomatic for years, and the disease was found quiescent in the 3.7% of the general population; what render this disease difficult to recognize, specifically in sporadic cases with no family history of SCD. In a large Cohort enrolling 100 patients diagnosed with ARVD, follow up showed that palpitation, syncope and death were the most common reported symptoms at diagnosis (27%, 26%, and 23% respectively). In patient presenting with palpitation, sustained or non-sustained Ventricular Tachycardia (VT) that arises from the Right ventricle (its inflow track, apex or outflow track; the “triangle of dysplasia”) with a Left Bundle Branch Block (LBBB) pattern were the most common arrhythmia. Less often, Supraventricular Tachyarrhythmia (SVT) is the solely finding. When it is present, atrial fibrillation accounts for more than 80% of cases. In familial ARVD with autosomal recessive pattern; palmoplantar Keratosis and woolly hair are commonly associated. For the first time the genesis of fat and apoptosis was demonstrated by the San Diego’s group (Kim, Nature 2013), by cellular reprogramming of somatic cells to patient-specific induced pluripotent stem cells, enabling in vitro modelling of human genetic disorders, and revealing the pathological hallmarks of ARVD; the progressive fibrofatty infiltration and the inappropriate desmosomal function when dealing with mechanical stress, leading to myocyte detachment and apoptosis primarily in the RV. This process is superimposed initially by inflammation, myocarditis, as active phase of ARVD, which is the result of increased susceptibility to cardiotropic viruses which can explain “replacement fibrosis” on top of “interstitial” fibrosis. The arrhythmic substrate is mainly conducted by three mechanisms: flare of myocarditis, fibrofatty infiltrates that facilitate macroreentry, and gap junction remodelling secondary to altered mechanical coupling[14,15]. Two established way of inheritance have been labelled in ARVD: autosomal dominant form, the most common one, and a rare autosomal recessive form, where ARVD takes part of a cardio-cutaneous syndrome; hyperkeratosis of palms and soles and woolly hair (Naxos disease and Carvajal syndrome)[16,17]. Variety of genes may be implicated in ARVD and desmosomal mutations including: Junctional Plakogloblin (JUP; causally involved in Naxos Disease), desmoplakin (DSP; identified in autosomal dominant ARVD, due to a missense mutation linked to 6p24; also implicated in autosomal recessive Carvajal syndrome, due to mutation in the exon 24 of the desmoplakin gene), Plakophilin-2 (PKP2), TMEM43, Desmocollin-2 (DSC2), and Desmmoglein-2 (DSG2). Individuals with PKP2 present at younger age and more likely to develop malignant arrhythmias, giving a prognostic importance to genetic testing for ARVD[18,19]. This recent molecular genetic approach of cardiomyopathies is at the same time of important benefit by improving the diagnostic tools, predictions[20,21]; and a challenge to physicians to become able to integrate this recent knowledge into diagnosis and improving managements[22,23]. A sequence of electrocardiographic and imaging evaluations are recommended as initial approach to patient with high index of suspicion for ARVD; patients with no apparent heart disease who present with symptomatic or asymptomatic VT of LBBB configuration; survivors of SCD, especially the ones that occur during endurance sports. If still non diagnostic invasive procedure will follow such as; right ventricular contrast angiography, endomyocardial biopsy, electrophysiologic. Strong family history (unexplained premature death, arrhythmia symptoms and conduction disease) may increase the pretest probability from 1: 2000 - 5000 to 1: 2. When a patient meets the diagnostic criteria for ARVD, clinical evaluation of at least first-degree relatives is seriously recommended. 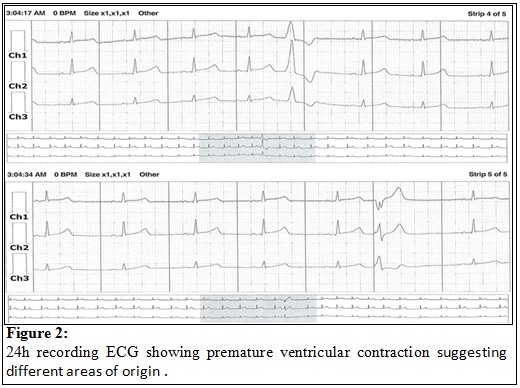 12-lead ECG findings in ARVD include the following[28,29]: QRS prolongation in right precordial leads, V1 through V3 , due to the delay in RV activation. Incomplete or complete Right Bundle Branch Block (RBBB), due to the conduction delay. Prolonged S wave upstroke (from the nadir of the S wave to the isoelectric baseline ≥ 55 msec). Epsilon wave is much more frequently observed as a “slurring” at the base of QRS complexes more frequently found in right precordial leads, due to the delayed activation of some portion of the RV, is a major criterion in the 2010 revised Task Force criteria, as well as, the inversion of the T waves in the right precordial leads (V1, V2, V3) in individual ≥ 14 years of age (in the absence of complete RBBB). These findings if not noted at presentation, the majority of patient will develop them in the upcoming 6 years of the disease progression. Signal-averaged ECG shows the following abnormalities: Filtered QRS duration ≥ 114 msec. Duration of terminal QRS < 40 micro V ≥ 38 msec. Root-mean-square voltage of terminal 40 msec ≤ 20 micro V.
Transthoracic echocardiography should be performed in all patient undergoing workup for ARVD. And the following are the noticed abnormalities: As major revised Task Force criteria; regional RV akinesia, dyskinesia, or bulges and 1 of the following, end diastolic RVOT ≥ 32 mm in the Parasternal Long Axis View (PLAX) or end diastolic RVOT ≥ 36 mm in the Parasternal Short Axis View (PSAX) or fractional area change ≤ 33%. As minor revised Task force criteria; regional RV akinesia or dyskinesia and 1 of the following: End diastolic RVOT ≥ 29 to < 32 mm in the PLAX, or end diastolic RVOT ≥ 32 to < 36 mm in the PSAX, or fractional area change > 33% to ≤ 40%. CMR imaging is a valuable diagnostic tool in the evaluation of ARVD. Not commonly performed in all patients with suspicion of ARVD, especially if other tests have led to definite diagnosis of ARVD. However, when other means are non-diagnostic, CMR should be performed. It identifies global and regional ventricular dilation, dysfunction, intramyocardial fat, Late Gadolinium Enhancement (LGE) and focal wall thinning. The conventional criteria that can be displayed with CMR as major criteria are: the high signal intensity on T1-weighted images of the fatty infiltration of the RV myocardium; regional wall motion abnormalities (akinesis or dyskinesis or dyssynchronous RV contraction); bulges of the RV and RVOT; dilatation of the RV and the RVOT (RV end-diastolic volume ≥ 110 ml/m2 in men; ≥ 100 ml/m² in women); and global systolic dysfunction (depressed RV ejection fraction (RVEF ≤ 40%). As for minor CMR criteria: first, the RV wall motion abnormalities (as in major criteria) and lesser degrees of RV and RVOT dilatation (RV end-diastolic volume ≥ 100 ml/m² in men; ≥ 90 ml/m² in women); RVEF ≤ 45% and global diastolic dysfunction. Right ventricular contrast angiography, is not routinely performed, only if we still miss the exact diagnosis by other imaging. It may provide valuable information about the RV structure and function. Findings include: hypertrophic trabeculae aligned transversely and detached by deep fissures; coarse trabeculae in the apical region; increased RV volume. And according to the revised Task Force criteria, the presence of regional RV akinesis, dyskinesis, or bulges by angiography is a major criterion. Electrophysiologic (EP) testing in ARVD is primarily used in refractory ventricular arrhythmias and not as a routine part of the diagnosis. The identification of low-voltage areas during EP testing is associated with increased risk of future ventricular arrhythmias. Endomyocardial Biopsy (EMB), only recommended when other non invasive diagnostic tools still inconclusive. It carries a rare risk of perforation because of fibrosis. The documentation of pathologic fibrofatty infiltration on EMB remains crucial and a major criterion in the modified Task criteria. Recommending ICD implants for relatives of sudden cardiac death victims without definite criteria, will certainly lead to medical and psychological disasters. We came to a conclusion that at this point of time with the current knowledge, it is impossible to predict which relative will manifest the disease and who will not[36-38]. In our opinion the best approach is to perform ECG’s Holter monitoring and 2D echocardiograms on the willing relatives. In the presence of inverted T waves on the precordial leads or frequent PVC’s on Holter or suspicious echocardiogram request a CMR. If the CMR is abnormal recommend ICD implant. If the CMR is normal you need to teach the patient that this does not exclude the disease. Patients should be instructed that they still need to follow up yearly, and to consult their physician as soon as possible if they experience syncope or palpitations. We should not be shy repeating the above mentioned non invasive tests on a regular basis. We recommend, for medico-legal purposes interpreting the tests with no findings of malignancy, rather than “Normal”. In spite of the previously listed diagnostic tools, major and minor criteria of the modified Task force criteria, the diagnosis of ARVD remains a true challenge requiring a high index of clinical suspicion. Genotyping is important for a positive diagnosis, but with the most recent advance, we still lack a single diagnostic tool to clearly and easily identify ARVD. 1. Fontaine, G., Guiraudon, G., Frank, R., et al. Stimulation studies and epicardial mapping in ventricular tachycardia: study of mechanisms and selection for surgery. in Kulbertus HE, editor. Reentrant Arrhythmias. Lancaster (1977) MTP Pub e334-e350. 2. Marcus, F.I., Fontaine, G.H., Guiraudon, G., et al. Right ventricular dysplasia: a report of 24 adult cases. (1982) Circulation 65(2): 384-398. 3. Behr, E.R., Dalageorgou, C., Christiansen, M., et al. Sudden arrhythmic death syndrome: familial evaluation identifies inheritable heart disease in the majority of families. (2008) Eur Heart J 29(13): 1670-1680. 4. Corrado, D., Thiene, G. Arrhythmogenic right ventricular cardiomyopathy/dysplasia clinical impact of molecular genetic studies. (2006) Circulation 113(13): 1634-1637. 5. Marcus, F., Towbin, J.A., Zareba, W., et al. Arrhythmogenic right ventricular dysplasia/cardiomyopathy (ARVD/C) a multidisciplinary study: design and protocol. (2003) Circulation 107(23): 2975-2978. 6. Dalal, D., Nasir, K., Bomma, C., et al. Arrhythmogenic right ventricular dysplasia: a United States experience. (2005) Circulation 112(25): 3823-3832. 7. Ruwald, A.C., Marcus, F., Link, M., et al. Association of competitive and recreational sport participation with cardiac events in patients with arrhythmogenic right ventricular cardiomyopathy: results from the North American multidisciplinary study of arrhythmogenic right ventricular cardiomyopathy. (2015) Eur Heart J 36(27): 1735-1743. 8. Fontaine, G., Chen, H.V. Arrhythmogenic right ventricular dysplasia back in force. (2014) Am J Cardiol 113(10): 1735-1739. 9. Frank I. Marcus, Nava, A., Thiene, G. Arrhythmogenic RV Cardiomyopathy/Dysplasia: Recent Advances. (2007) Springer Science & Business Media. 10. Camm, C.F., James, C.A., Tichnell, C., et al. Prevalence of atrial arrhythmias in arrhythmogenic right ventricular dysplasia/cardiomyopathy. (2013) Heart Rhythm 10(11): 1661-1668. 11. Protonotarios, N., Tsatsopoulou, A. Naxos Disease. (2005) Indian Pacing Electrophysiol J 5(2): 76-80. 12. Kim, C., Wong, J., Wen, J., et al. Studying arrhythmogenic right ventricular dysplasia with patient-specific iPSCs. (2013) Nature 494(7435): 105-110. 13. Lopez-Ayala, J.M., Pastor-Quirante, F., Gonzalez-Carrillo, J., et al. Genetics of myocarditis in arrhythmogenic right ventricular dysplasia. (2015) Heart Rhythm 12(4): 766-773. 14. Kaplan, S.R., Gard, J.J., Carvajal-Huerta, L., et al. Structural and molecular pathology of the heart in Carvajal syndrome. (2004) Cardiovasc Pathol 13(1): 26-32. 15. Sen-Chowdhry, S., Syrris, P., McKenna, W.J. Genetics of right ventricular cardiomyopathy. (2005) J Cardiovasc Electrophysiol 16(8): 927-935. 16. Protonotarios, N., Tsatsopoulou, A., Patsourakos, P., et al. Cardiac abnormalities in familial palmoplantar keratosis. (1986) Br Heart J 56(4): 321-326. 17. Norgett, E.E., Hatsell, S.J., Carvajal-Huerta, L., et al. Recessive mutation in desmoplakin disrupts desmoplakin–intermediate filament interactions and causes dilated cardiomyopathy, woolly hair and keratoderma. (2000) Hum Mol Genet 9(18): 2761-2766. 18. Dalal, D., Molin, L.H., Piccini, J., et al. Clinical features of arrhythmogenic right ventricular dysplasia/cardiomyopathy associated with mutations in plakophilin-2. (2006) Circulation 113(13): 1641-1649. 19. Rigato, I., Bauce, B., Rampazzo, A., et al. Compound and digenic heterozygosity predicts lifetime arrhythmic outcome and sudden cardiac death in desmosomal gene-related arrhythmogenic right ventricular cardiomyopathy. (2013) Circ Cardiovasc Genet 6(6): 533-542. 20. Charron, P., Arad, M., Arbustini, E., et al. Genetic counselling and testing in cardiomyopathies: a position statement of the European Society of Cardiology Working Group on Myocardial and Pericardial Diseases. (2010) Eur Heart J 31(22): 2715-2726. 21. Ormondroyd, E., Oates, S., Parker, M., et al. Pre-symptomatic genetic testing for inherited cardiac conditions: a qualitative exploration of psychosocial and ethical implications. (2014) Eur J Hum Genet 22(1): 88-93. 22. Marathe, J.A., Woodroffe, J., Ogden, K., et al. General Practitioners’ knowledge and use of genetic counselling in managing patients with genetic cardiac disease in non-specialised settings. (2015) J Community Genet 6(4): 375-382. 23. Protonotarios, A., Anastasakis, A., Panagiotakos, D.B., et al. Arrhythmic risk assessment in genotyped families with arrhythmogenic right ventricular cardiomyopathy. (2015) Europace. 24. Hoffmayer, K.S., Scheinman, M.M. Electrocardiographic patterns of ventricular arrhythmias in arrhythmogenic right ventricular Dysplasia/Cardiomyopathy. (2012) Front Physiol 3: 23. 25. Steriotis, A.K., Nava, A., Rigato, I., et al. Noninvasive cardiac screening in young athletes with ventricular arrhythmias. 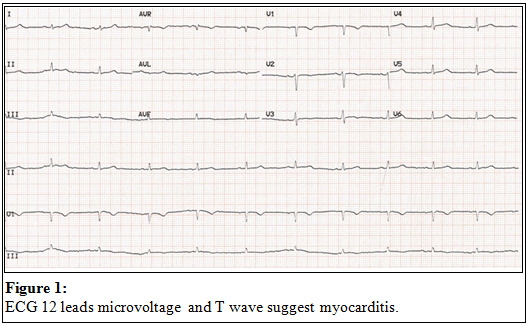 (2013) Am J Cardiol 111(4): 557-562. 26. Tabib, A., Loire, R., Chalabreysse, L., et al. Circumstances of death and gross and microscopic observations in a series of 200 cases of sudden death associated with arrhythmogenic right ventricular cardiomyopathy and/or dysplasia. (2003) Circulation 108(24): 3000-3005. 27. Nava, A., Bauce, B., Basso, C., et al. Clinical profile and long-term follow-up of 37 families with arrhythmogenic right ventricular cardiomyopathy. (2000) J Am Coll Cardiol 36(7): 2226-2233. 28. Nasir, K., Bomma, C., Tandri, H., et al. Electrocardiographic features of arrhythmogenic right ventricular dysplasia/cardiomyopathy according to disease severity: a need to broaden diagnostic criteria. (2004) Circulation 110(12): 1527-1534. 29. Zhang, L., Liu, L., Kowey, P.R., et al. The electrocardiographic manifestations of arrhythmogenic right ventricular dysplasia. (2014) Curr Cardiol Rev 10(3): 237-245. 30. Marcus, F.I., McKenna, W.J., Sherrill, D., et al. Diagnosis of arrhythmogenic right ventricular cardiomyopathy/dysplasia proposed modification of the task force criteria. (2010) Circulation 121(13): 1533-1541. 31. Lindsay, B.D. Challenges of diagnosis and risk stratification in patients with arrhythmogenic right ventricular cardiomyopathy/dysplasia. (2013) J Am Coll Cardiol 62(19): 1770-1771. 32. Yoerger, D.M., Marcus, F., Sherrill, D., et al. Echocardiographic findings in patients meeting task force criteria for arrhythmogenic right ventricular dysplasia: new insights from the multidisciplinary study of right ventricular dysplasia. (2005) J Am Coll Cardiol 45(6): 860-865. 33. ElMaghawry, M., Migliore, F., Mohammed, N., et al. Science and practice of arrhythmogenic cardiomyopathy: A paradigm shift. (2013) Glob Cardiol Sci Pract 2013(1): 63-79. 34. Migliore, F., Zorzi, A., Silvano, M., et al. prognostic value of endocardial voltage mapping in patients with arrhythmogenic right ventricular cardiomyopathy/dysplasia. (2013) Circ Arrhythm Electrophysiol 6(1): 167-176. 35. Paul, M., Stypmann, J., Gerss, J., et al. Safety of endomyocardial biopsy in patients with arrhythmogenic right ventricular cardiomyopathy: a study analyzing 161 diagnostic procedures. (2011) JACC Cardiovasc Interv 4(10): 1142-1148. 36. Link, M.S., Laidlaw, D., Polonsky, B., et al. Ventricular arrhythmias in the North American multidisciplinary study of ARVC: predictors, characteristics, and treatment. (2014) J Am Coll Cardiol 64(2): 119-125. 37. Corrado, D., Leoni, L., Link, M.S., et al. Implantable cardioverter-defibrillator therapy for prevention of sudden death in patients with arrhythmogenic right ventricular cardiomyopathy/dysplasia. (2003) Circulation 108(25): 3084-3091. 38. Wichter, T., Paul, M., Wollmann, C., et al. Implantable cardioverter/defibrillator therapy in arrhythmogenic right ventricular cardiomyopathy: single-center experience of long-term follow-up and complications in 60 patients. (2004) Circulation 109(12): 1503-1508. 39. Schinkel, A.F.L. Implantable cardioverter defibrillators in arrhythmogenic right ventricular dysplasia/cardiomyopathy patient outcomes, incidence of appropriate and inappropriate interventions, and complications. (2013) Circ Arrhythm Electrophysiol 6(3): 562-568. 40. Fressart, V., Duthoit, G., Donal, E., et al. Desmosomal gene analysis in arrhythmogenic right ventricular dysplasia/cardiomyopathy: spectrum of mutations and clinical impact in practice. (2010) Europace 12(6): 861-868.